Additional features commonly found in many of the best pricing and quoting systems raise the level of benefit realised by several orders of magnitude. These include automated proposal generation, estimating software, configuration technology and quotation-management software. Mass customisation, while maintaining the economics of mass production found in repetitive manufacturing shops, is the ongoing goal of almost any advanced manufacturing operation. Industries like HVAC operate in not only the repetitive home-based marketplace but also in the near-custom or contract market of large residential and commercial centralised HVAC systems. The ability to operate globally is critical to manufacturers of high-tech, complex products. Localisation in terms of pricing, product content and regulatory requirements are universal challenges for HVAC, industrial equipment, electronics, specialty vehicles and power-generation manufacturers. For the seller, a business-rules-driven configuration process ensures that the product being configured will meet all localised requirements in terms of product content, regulatory controls and pricing. Medical and high-tech manufacturers especially, as well as industrial-equipment makers are sensitive to rapid development and productisation of new solutions. Obsolescence is inevitable for almost any product, and the ability to stay ahead of the market and deliver tomorrow’s solution today is how success is realised. Much of the rapid rollout burden rests on the effectiveness of the sales force involved. 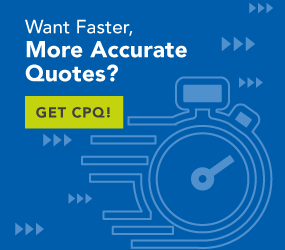 CPQ technology mitigates this by embedding much of the expert knowledge requirement and complex pricing within the guided-selling elements of the solution. Rote memorisation of product specs and complex pricing are handled within the AI-driven configuration and pricing elements of the cost-estimating software. By example, high prices and low volumes are the challenges found within the specialty-vehicle market. The industry and its customers benefit from the ability to utilise common vehicle chassis and drivetrain components for a wide variety of end uses. Sanitation trucks, firetrucks and construction vehicles may be built around the same basic product. For instance, commercial HVAC is typically more customised and tailored to the specific building design, location and ambient climatic conditions involved. Commercial HVAC leans toward the contract-manufacturing end of the spectrum. A building constructed for Minneapolis may be identical to a building going up in Tucson. However, the HVAC requirements for each will be different due to the different local climatic conditions.